For years Dave and I have debated the idea of moving to Seattle, Washington. We loved our home in Northern California, but there was always something about the scenery - and the scene - in Seattle that had attracted us. Given the grey days and the rain we had early in our New Zealand trip, we started using it as a test of whether we would be able to hack it in the Emerald City. Here is what I learned in less than a week in New Zealand: the sun feels so good. After days of constant drizzle and downpour, we were treated to three fabulous days of sun. It lightened my mood immensely and made our days so much more enjoyable. I may not be ready for Seattle just yet. A little less than a week into our trip, we found ourselves in the depths of the South Island, where the sun shined bright with the mission of attending the Bluff Oyster Festival. We had two days to explore before the festival and spent them in the Catlins - a wonderfully scenic national park with many more sheep, cows and horses than people. Sheep grazing in the Catlins. The rain does have three distinct benefits - rainbows, waterfalls and sparkling green hillsides. As we left the black rainclouds behind on the East Coast, rainbow after rainbow lit our path to the coastal area of the Catlins. A rainbow on our route to the Catlins. A full rainbow, of which I had only ever seen before by drawing my own, sat over the ocean at the very point where the lighthouse at Nugget Point hung at the edge of the cliff. Eight of us, all having walked the path from our various camper vans, stood in awe - looking out to the point where the rainbow met the water to see if there really was a pot of gold at the end. I'm sad to report that I am no richer, except for the experience. Full rainbow over Nugget Point Lighthouse. We were near the very edge of the island - where Antarctica is the next land mass - and the water was the same turquoise blue we had seen around the islands in Thailand. The crystal blue water, rainbows and the waves crashing against the rocks said hello in the grandest way. The vast amounts of rain over the week also had the waterfalls in the Catlins raging. Through soggy rain forests, we followed the sound of crashing water to both the Matai Falls and McLean Falls. Moving our stiff legs after days in the camper van felt incredible with the handsome reward of immense and beautiful waterfalls. Dave dwarfed by Mclean Falls. The sun doesn't rise in this part of the world right now until 8 a.m. 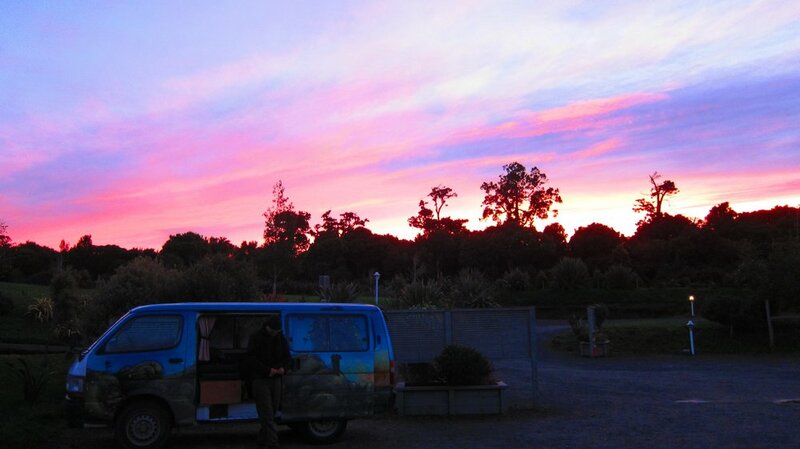 It helps us sleep away the cold early hours of the morning and treats us to beautifully pink and purple painted skies when we finally roll out of the van. Our last morning in the Catlins was picture perfect and we drove through the park seeing nothing but sheep and the occasional roadside deer. An incredible sunrise our last morning in the Catlins. We high-tailed it to Slope Point, the furthest point south on the South Island, on the way to the oyster festival. The route was 15 kilometers down a gravel road and a 20-minute walk 20through a sheep pasture to get us to Slope Point. Sure, it was only a sign where the land meets the ocean, but I knew that if I looked hard enough I could see the 4,800 kilometers to the South Pole. Slope Point - the farthest point south on the South Island of New Zealand. These oysters are big business here in New Zealand. Every time we mentioned we were headed to the festival, whoever we were speaking with looked away dreamily as they would tell us about the last time they got their hands on Bluff oysters. Turns out, they are worth the hype. Plump, thick and juicy - plate after plate was begin consumed in and outside the oyster tent. Major oyster opening happening all day long. This was a great locals festival. The emcee told Kiwi jokes all day long, a band was interrupted halfway through their set to allow the fashion show contestants on stage and we were told the 4.8% beer we were drinking was going to get us drunk really quick (they like their lagers down here). The sun stayed out most of the day so that alone made the festival good. Add in the salmon sandwiches, salmon and brie pies and the oysters we consumed and it was a great festival. Also, lots of oyster eating. We're still not sure if the festival alone was worth the trip to the soggy and chilly south, but being near the end of the world is a pretty good story to tell.